TAIPEI/WASHINGTON (REUTERS) - China has deployed an advanced surface-to-air missile system to one of the disputed islands it controls in the South China Sea, Taiwan and US officials said, ratcheting up tensions even as US President Barack Obama urged restraint in the region. Taiwan defence ministry spokesman David Lo told Reuters that the missile batteries had been set up on Woody Island. 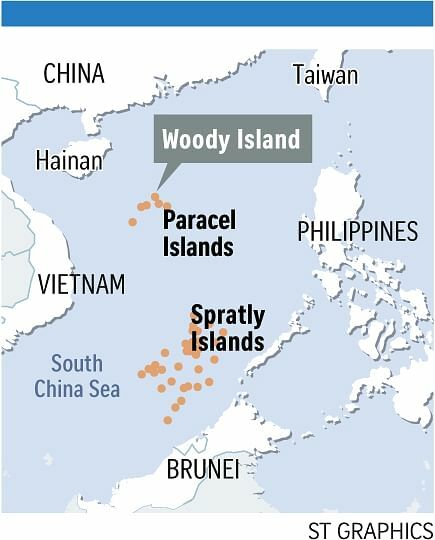 The island is part of the Paracels chain, under Chinese control for more than 40 years but also claimed by Taiwan and Vietnam. “Interested parties should work together to maintain peace and stability in the South China Sea region and refrain from taking any unilateral measures that would increase tensions,” Major General Lo said on Wednesday (Feb 17). A US defence official also confirmed the “apparent deployment” of the missiles, first reported by Fox News. China’s foreign minister said the reports were created by“certain Western media” that should focus more on China’s building of lighthouses to improve shipping safety in the region. “As for the limited and necessary self-defence facilities that China has built on islands and reefs we have people stationed on, this is consistent with the right to self-protection that China is entitled to under international law so there should be no question about it,” Mr Wang Yi told reporters in Beijing. China claims most of the South China Sea, through which more than US$5 trillion (S$7 trillion) in global trade passes every year, and has been building runways and other infrastructure on artificial islands to bolster its title. The United States has said it will continue conducting “freedom of navigation patrols” by ships and aircraft to assure unimpeded passage through the region, where Vietnam, Malaysia, Brunei, the Philippines and Taiwan have rival claims. Admiral Harry Harris, the commander of the US Pacific Command, said the deployment of missiles to the Paracels would not be a surprise but would be a concern, and be contrary to China’s pledge not to militarise the region. News of the missile deployment came as Mr Obama and leaders of the Association of South-east Asian Nations concluded a summit in California, where they discussed the need to ease tensions in the South China Sea but did not include specific mention of China’s assertive pursuit of its claims there. China’s increasing military presence in the disputed sea could effectively lead to a Beijing-controlled air defence zone, analysts said. “(The missile deployment) reinforces the view that China intends to exert growing control in these international waters, including potentially by declaring an Air Defence Identification Zone,” said Dr Rory Medcalf, Head of the National Security College at the Australian National University. Dr Mira Rapp-Hooper, a South China Sea expert from the Centre for a New American Security, said it was not the first time that China has sent such weapons to the Paracels. Taiwan President-elect Tsai Ing-wen said tensions were now higher in the region. “We urge all parties to work on the situation based on principles of peaceful solution and self-control,” she told reporters. Vietnam’s foreign ministry did not immediately respond to requests for comment. But in a rare move, the country’s prime minister on Monday pressed Mr Obama for a greater US role in preventing militarisation and island-building in the South China Sea. The missiles arrived over the past week and, according to a US official, appeared to show the HQ-9 air defence system, which has a range of 200 km and would pose a threat to any airplanes flying close by, the report said.